L.A. Weekly is excited to confirm the final restaurant line up for our new signature event, Burgers & Beer, taking place on Saturday August 8th, from 3 to 7 p.m. at The Los Angeles Memorial Coliseum in DTLA. Curated by LA Weekly’s own award- winning restaurant critic Besha Rodell and food editor Sarah Bennett, this event will feature Los Angeles’ best burger restaurants serving their signature sliders and the state’s best craft breweries sampling the brews that have made them famous! As of press time, the following restaurants have confirmed attendance at this year’s event: animal, Abigaile, Bacaro LA, Badmaash, Barrel & Ashes, Belcampo Meat Co., Bouchon Bistro, Cassell’s Burgers, Escala, Grill ‘Em All, Haché LA, Hamburguesas Punta Cabras, Hawkins House of Burgers, Little Dom’s, Local Table, Mariscos El Cristalazo, Meat District Co., Messhall, Myke’s Café, Mrs. Fish, Perch LA, Pie n’ Burger, Pink’s Hot Dogs, Plan Check Kitchen + Bar, Pono Burger, Rush Street Culver City, salt’s cure, Seoul Sausage Company, Simmzy’s, Slater’s 50/50, The Churchill, The Counter, The Hudson, The Independence, the hungry cat, The Pikey, The Rockefeller, The Tripel, Vaka Burger, Venice Whaler and WOODSPOON. As of press time, the following breweries have confirmed attendance at this year’s event: Ace Cider, Alosta Brewing Co., Anchor Brewing Co., Angel City Brewery, Beachwood BBQ & Brewing, Belching Beaver Brewery, Boomtown Brewery, Bottle Logic Brewing, Bravery Brewing, Brewery Ommegang, Cabotella Mexican Ale, Drake’s Brewing, The Dudes’ Brewing, Eagle Rock Brewery, El Segundo Brewing, Fireman’s Brew, Firestone Walker Brewing Company, Golden Road Brewing, Humboldt Brewing Company, I&I Brewing, Karl Strauss Brewing Company, King Harbor Brewing Company, Kinetic Brewing Company, Kona Brewing Co., Ladyface Ale Companie, The Lagunitas Brewing Company, MacLeod Ale Brewing Co., Mumford Brewing, Ninkasi Brewing Company, Phantom Carriage Brewery, St. Killian Importing, Strand Brewing Co., Sudwerk Brewering Co., Telegraph Brewing, and Wolf Creek Brewery. 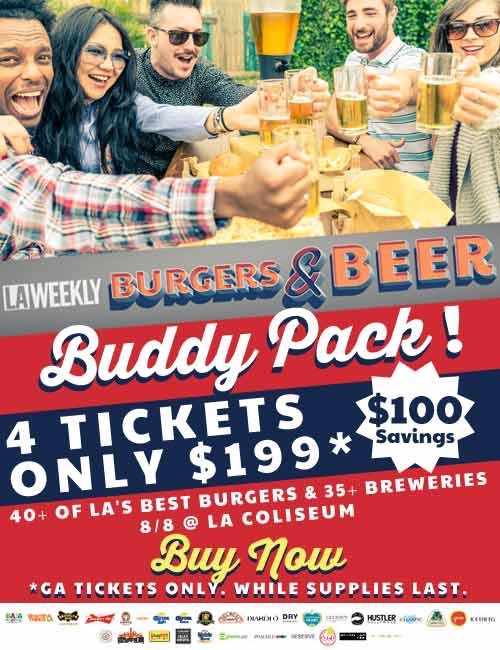 For a limited time, LA Weekly is offering a Burgers & Beer Buddy Pack where guests can purchase 4 General Admission tickets for only $199. General Admission tickets are available starting at $75 for a single ticket and include entry into the event, unlimited food samples from 35+ restaurants, craft beer samples from 30+ breweries, access to entertainment and a vendor village. A limited number of Burger Only tickets will be available starting at $45 and include entry into the event, unlimited food samples from 35+ restaurants and access to entertainment and a vendor village. Tickets can be purchased at: https://www.ticketfly.com/purchase/event/852407. A portion of this year’s event proceeds will be benefitting Homeboy Industries who provides hope, training, and support to formerly incarcerated men and women allowing them to redirect their lives and become contributing members of our community. Sponsors of this year’s event include: Baja California Tourism Board, Barefoot Wine & Bubbly, Beautiful Things LA, Budweiser, Califia Farms, Caviar, Constellation Brands , CrafBeerKings.com, CVT Soft Serve, Del Real, Diabolo, Dry Sparkling, Elysian, First Aid Shot Therapy, Follow Your Heart, Goose Island, Gustus Vitae, Hustler, Icelandic Glacial, Jarritos Jeni’s Splendid Ice Creams, Joshua Cohen Bike Attorney, LA Car Guy, London Manori Jewelry, Ludlows, O.pen Vape, PoachedJobs.com, Pop Candy, RESERVE, Socal Etsy Guild, and Spearmint Rhino. Follow L.A. Weekly on Facebook facebook.com/LAWeekly, Twitter @laweeklystreet, Instagram @laweekly and foursquare for updates as they unfold. Don’t miss out on our inaugural Burgers & Beer celebration! We hope to see you there!